Posted on June 10, 2013 by Susan H.
Strawberry season is almost upon us here in Southern Ontario…I am sooo looking forward to picking some local strawberries for my annual Strawberry Freezer Jam. I have a few jars left from last year…the perfect complement for my neighbour and friend Leslie’s Cornmeal Muffin recipe…which I have adapted to be dairy and egg free. Oh my gosh…these were sooooo good! I popped on over…basket in hand…to share them with Leslie and a few of my neighbours. 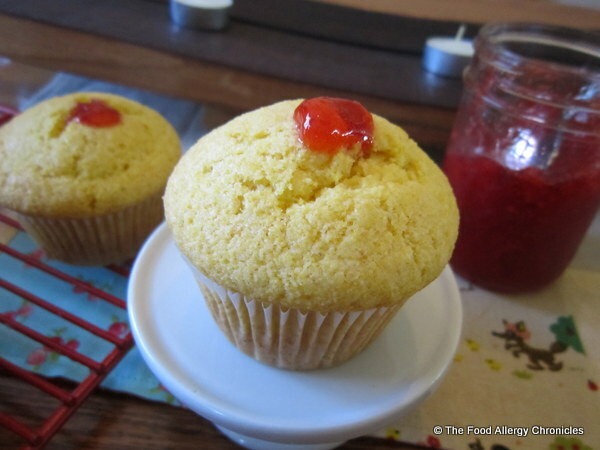 In my opinion, the hint of lemon with the strawberry jam…the best! 1. Replaced the 1 cup of milk with 1 cup Natur-a Rice Beverage mixed with 1 tbsp. of freshly squeezed lemon juice…let sit a few minutes. 2. Replaced the 2 eggs with a one egg substitute: 1/2 tsp baking soda added to dry ingredients and 2 tbsp. water added to the wet ingredients. 3. Added 1 tbsp. lemon zest to add a ‘hint of sunshine‘…plus I love the combination of lemon and strawberry. In a large bowl, mix together the sugar and oil. Stir in the water and lemon zest. Alternately, stir in the dry ingredients and then the rice beverage mixture…ending with the dry ingredients. Fill paper/silicone muffin cups with batter. Bake 400 F for 20 minutes. Let cool for 10 minutes before removing from muffin tin to finish cooling on cooling rack. 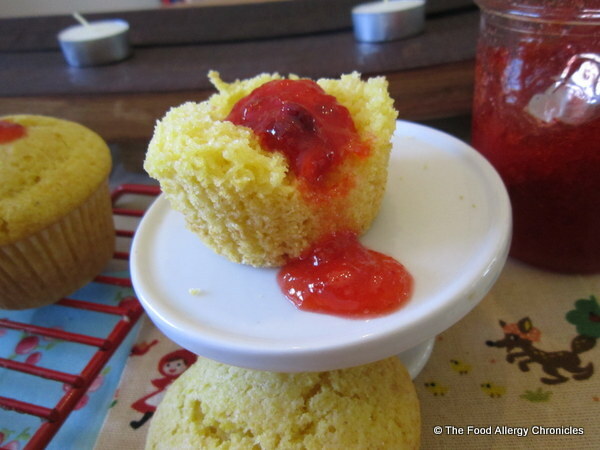 …filling them with homemade Strawberry Jam brings them to the next level! Or split them open and enjoy with a dollop on top! Tip 1: For a savory cornmeal muffin…add some crumbled cooked bacon and fresh herbs like thyme, parsley or sage. Tip 2: Try baking the batter in a 9 inch square pan at 400 F for 30 minutes to slice and serve at your next picnic. P.S. Click here to view my post on Dairy, Egg, Soy and Peanut/Tree Nut Free Mini Lemon Blueberry Cornmeal Muffins. P.P.S. Click here for the post on last year’s strawberry picking at Watson’s Farms, my homemade freezer jam and a couple of recipes for all those strawberries you couldn’t help picking this year…Dairy, Egg, Soy and Peanut/Tree Nut Free Strawberry Bread and Strawberry Bundt Cake. 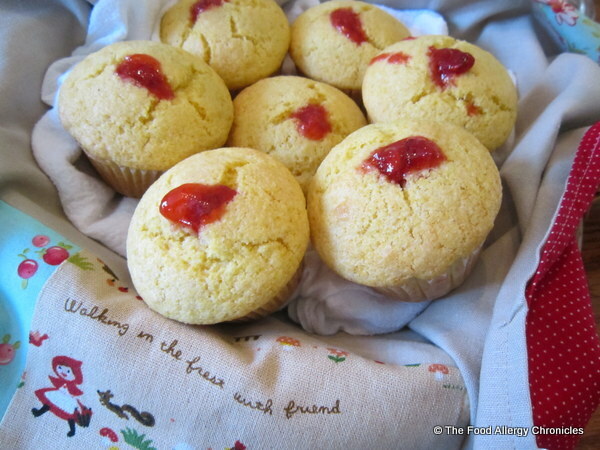 Are you a Cornmeal Muffin fan? 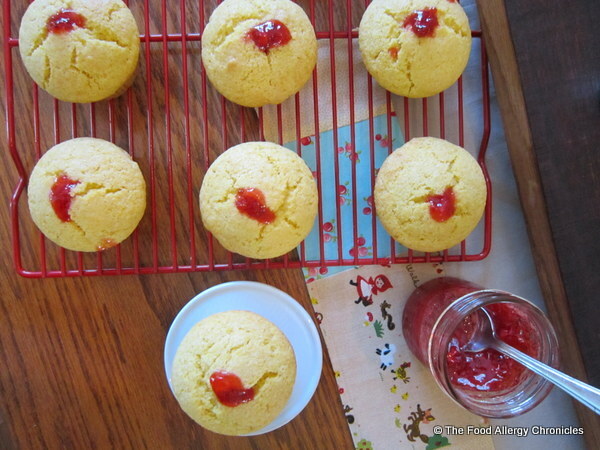 This entry was posted in allergies, baking, breads, dairy free, egg free, muffins, peanut/tree nut free, sesame free, soy free and tagged Dairy Egg Soy and Peanut/Tree Nut Free Homemade Strawberry Jam Filled Lemon Cornmeal Muffins, homemade freezer strawberry jam, Natur-a Rice Beverage by Susan H.. Bookmark the permalink. The muffins were a hit here! Thanks so much for sharing 🙂 It was nice to sit a visit too. Thanks for sharing these, I am going to give these a try.